John Singer Sargent is remembered as a portrait painter, mostly of elegant women elegantly posed and dressed, like The Wyndham Sisters. His best known painting is of the enigmatic, not so conventionally dressed Madame X, which incited scandal at the Paris Salon in 1884, causing him to give up on seeking acceptance by the French artistic establishment and to concentrate his efforts in England and in his parents' homeland. 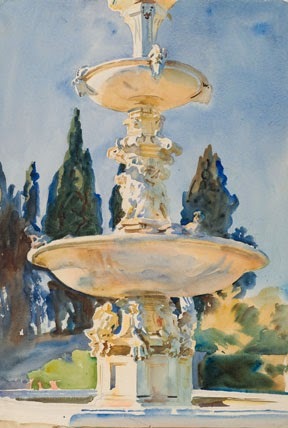 Sargent's parents were American expatriates; he was born in Florence and spent his childhood, youth, and young adulthood in various parts of Europe and in London. 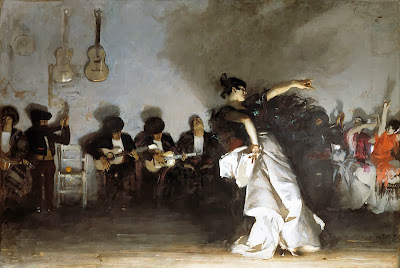 My favorite of Sargent's major works is not a posed portrait but El Jaleo (image above; for an enlargement see here), painted after the artist had visited Spain and seen a Gypsy dance performance. The dancer's white skirt could adorn a fashionable woman such as one of the Wyndham sisters, but her black feather boa, leaning backward posture and extended, slightly raised left arm, with her right arm thrust downward, hand extended outward holding a white handkerchief, is not a configuration in which an elegant nineteenth century woman would likely be found. Her left hand is in what Texans would know as the "Hook 'em Horns" position, and her index finger points toward a woman at the right edge of the painting, wearing a red-orange dress. She has both arms raised high and is smiling. Next to her is another woman, head tilted back, with her right arm flung in front of her neck. On the painting's left, behind the dancer, is a row of musicians. Most of these have heads bowed, intent on their instruments, but the one nearest the dancer, evidently a singer, has his head thrust back and his mouth agape. El Jaleo is part of the small but exquisite collection of my wife's favorite small art museum, the Isabella Stewart Gardner Museum, in Boston. Last summer I saw an exhibit of Sargent's watercolors at the Brooklyn Museum. In my "New Year's remembrances, thank-yous, and resolutions" I noted that i'd meant to post about it (as well as about the Hopper Drawing exhibit at the Whitney), and regretted that I'd procrastinated. Although the exhibit is no more, the Museum still has an excellent web page about it, so I'm using that page and its links to make up for my tardiness. 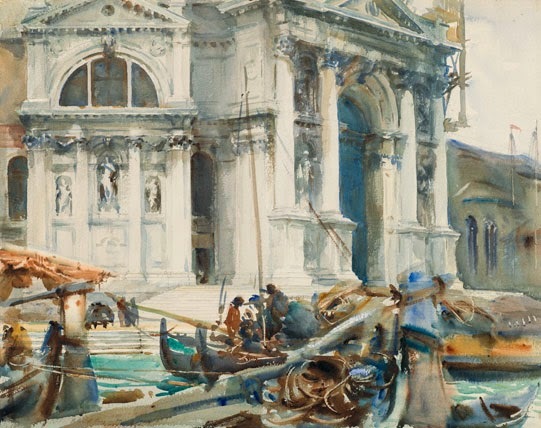 Sargent was a prolific watercolorist. A few of his works in that medium proved to be studies for later oil paintings, but most were a kind of travelogue, much like snapshots taken by a tourist today. That's not to say they were quickly dashed off: note the careful detailing of the church building in the Venetian scene above. According to the Museum's notes (click on the image of the painting at the right on the web page to see the notes), Sargent began with a careful graphite underdrawing of the church's structural features. The gondolas and canal in the foreground are done in a much more fluid style. summarily cropped away the two battling bronze figures at its top and nearly erased the smaller bronze boys perched on the edge of the lower basin. He directed his eye to transcribe only the bleached outlines and tinted shadows of the wide basins and decorative stone carvings in the raking glare. 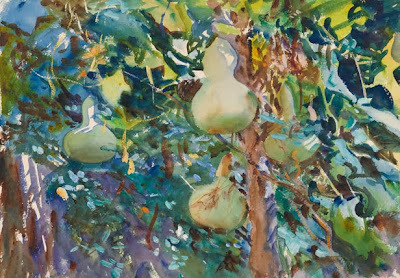 While Sargent didn't take the liberties with perspective and scale that, for example, Pierre Bonnard did, this painting shows a willingness to depart from a strict realism. Sargent brought the same skill to the painting of natural objects that he did to depicting human-made structures. These gourds seem almost pickable. Note also the sharp delineation of the leaves, stalk, and tendrils in the foreground, yielding to a slightly out-of-focus blurriness beyond. The notes call Gourds a display of "Sargent's extraordinary virtuosity." 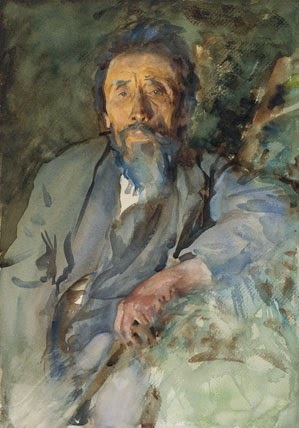 The work is a good example of [Sargent's] frequent use of wet subtraction to lift and remove color, seen in the strong diagonal wiping marks at the lower left and, more subtly, in the man’s sleeve, his left ear, the hairline of his forehead, and the tip of his nose. If, before I saw it in the exhibit, you had shown me this painting without attribution and asked me who painted it, I would have said, "Winslow Homer." As I'm a ship buff, it caught my eye in the gallery. 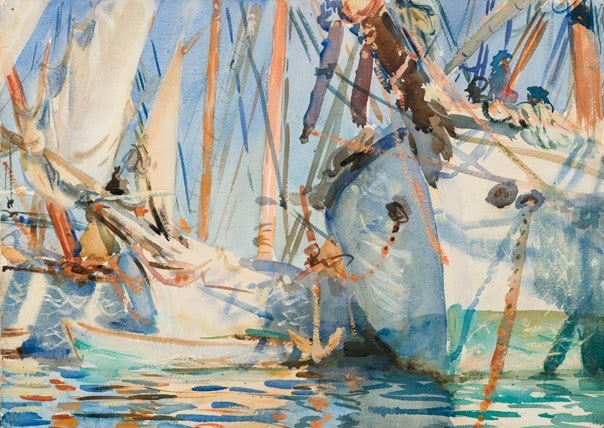 In this painting, according to the notes, instead of removing paint "Sargent used a small amount of clear wax on the right side of the larger boat in order to repel the blue washes and create highlights." On the Museum's web page for the exhibit, there's a link to an informative thirty second video by senior conservator Toni Owen, followed by readers' questions and M. Owen's answers. Well worth a look.